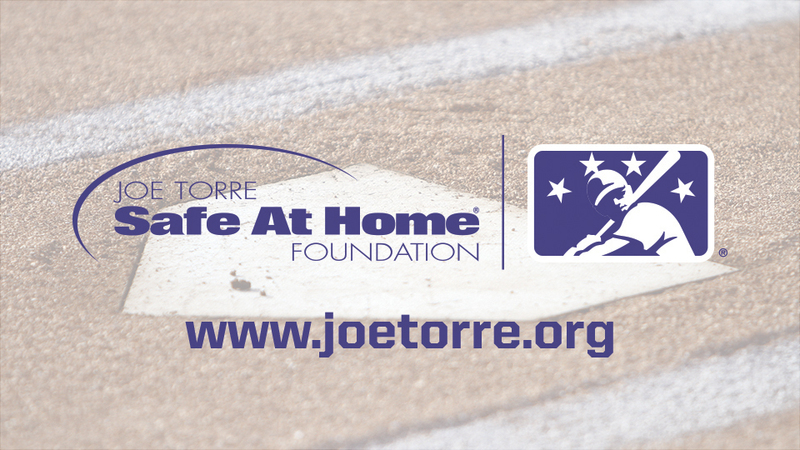 ST. PETERSBURG, Florida and NEW YORK -- Minor League Baseball™ (MiLB™) and The Joe Torre Safe At Home Foundation are partnering for a second year to spread awareness about domestic violence and help end its destructive cycle. Beginning tomorrow, and continuing through July 23, nearly 100 Minor League Baseball teams across the country will include Safe At Home's educational messaging in their gameday programming to educate fans about the lifelong, traumatizing impact that domestic violence has on youth victims. Teams will implement public address announcements and in-game videos, conduct a social media campaign, and provide information on resources available for those who may be victims of domestic violence. To advance education on this important issue, the Safe At Home Foundation has provided each participating MiLB team with information on three local organizations that educate the community about, and support victims of, domestic abuse. Teams are encouraged to contact and establish relationships with these organizations throughout the initiative. Each participating team will raffle or auction a Joe Torre autographed baseball to raise funds for a local organization that supports domestic violence or the Safe At Home Foundation. In addition, fans that attend games during the initiative will receive a Topps® baseball card pack along with a special edition Joe Torre baseball card featuring facts about the Joe Torre Safe At Home Foundation. "It is extremely important that we raise awareness about domestic violence and the impact that it has on millions of people, specifically children," said Pat O'Conner, Minor League Baseball President & CEO. "Supporting this cause which is so close to Joe is significant for me and for Minor League Baseball. We take great pride in knowing our ballparks are safe, family-friendly environments for all, making them a comfortable setting to educate fans on this topic so that every child can live a healthy life free from violence." "The effects of trauma on children, families and communities can be devastating and long-lasting," said Joe Torre, co-founder and Chairman of the Joe Torre Safe At Home Foundation. "I am thrilled to have Minor League Baseball join us as a partner to raise awareness and provide greater resources to those who need support on their journey to healing." For more information on the Safe At Home Foundation, visit www.joetorre.org. Many of the initiative's events can also be followed on social media using #MiLBEndsDV and #SafeAtHome. If you or someone you know is impacted by domestic violence, help is available. Call the National Domestic Violence Hotline at 800-799-7233 or visit www.thehotline.org. Founded in 2002 by Ali and Joe Torre, Safe At Home provides healing services to children and young adults who have witnessed or experienced violence and trauma -- including domestic violence, child abuse, teen dating violence, school shootings, and sexual assault. Since their founding, they have helped more than 85,000 children, have trained thousands of school staff and parents to create safer, more resilient communities and lead awareness and prevention campaigns to stop the cycle of violence. Their services are currently located in 17 schools in Los Angeles, California; Cincinnati, Ohio; Westchester County, New York; Union City, New Jersey; and New York City. For more information, visit www.joetorre.org. Follow the Foundation on Facebook, Twitter and Instagram.